Symphony d'Oro - Fly Around the World With Us! Fly Around the World With Us! 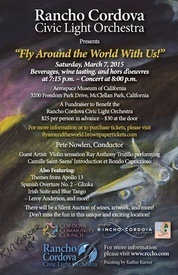 Rancho Cordova Civic Light Orchestra presents an evening of airplanes, wine, and music at the Aerospace Museum in McClellen Park. Borodin "On the Steps of Central Asia"
Music from Apollo 13 and more! Enjoy admission to the museum, a silent auction, and refreshments. Beverages and hors d'oeuvres start at 7:15. Concert begins at 8PM.